Children tend to resemble their parents, their siblings and to a lesser degree their extended family. You can make a good guess about how tall a child will grow up to be by averaging the height of his or her parents. These similarities among family members extend beyond height to a great many traits . Why do these traits run in families? One possibility is that they share an environment. Maybe parents intentionally raise their kids to be like them. Maybe there’s “something in the water”, as the old expression goes. Additionally some of it may be genetic, the end result of the DNA passed to each child from the biological parents at conception. This would help explain why for some traits an adopted child will more strongly resemble his or her biological parents than the adoptive parents, or why twins will more strongly resemble one another than siblings. When a trait can be passed on through genetics we call it “heritable”, since it is inherited from your biological parents. Some heritable traits, like your blood type or sickle-cell disease, are entirely determined by genetics in this way. Most traits, however, are only partially heritable. You probably have heard plenty of anecdotes about friends or family members who are unusually different from their families. The uncle who is 6 inches taller than everyone else in the family. The extrovert in a family full of introverts. These traits are heritable, but they may be affected buy a bunch of environmental factors as well. “Heritability”, then, is a way to describe how much a trait is related to genetics. We’ll leave the question of how we estimate heritability (and many other technical details) to a later post. Instead, let’s focus first on what heritability is, what it is not (i.e. common misconceptions), and why it’s something we’re interested in studying. First a semi-formal definition: heritability is the proportion of variation in a trait explained by inherited genetic variants . In other words, it’s a way to measure how much the differences in people’s DNA can explain the differences in their traits. Heritability can be between 0 (genetics explains nothing about the trait) and 1 (genetics explains everything). For example, the heritability of height is about 0.80, and the heritability of hours of sleep per night is 0.15-0.20 . Heritability estimates how well we could predict a trait from genetics (if we completely understood all the relevant genetic effects). Similarly, it also tells us how well we could predict the trait in you based on that trait in your parents. Actually making this prediction from your DNA would require precisely knowing the effect of every genetic variant, which is very, very far away from being a reality. But the heritability puts an upper limit on how good that prediction could ever be as we learn more about the genetics of the trait. Heritability measures how important genetics is to a trait. A high heritability, close to 1, indicates that genetics explain a lot of the variation in a trait between different people; a low heritability, near zero, indicates that most of the variation is not genetic. Just because a trait has a high heritability doesn’t necessarily mean that there’s some specific gene that directly causes it in some obvious biological way, but it does mean that the total contribution of direct and indirect causal effects and other correlations between specific DNA variants and the trait are enough to be informative . Heritability is a property of the population not the individual. When the heritability of a trait is described, it reflects how much variability in the population is a consequence of genetic factors. It does not “explain” why an individual has a disease. Heritability is specific to how a trait was measured. Traits that are harder to measure, and thus have more random measurement error, will be less heritable (since random measurement error isn’t genetic). This can also cause differences in heritability that depend on who measures the trait (e.g. reporting something about yourself vs. diagnoses from a doctor vs. physical measurements), or between a simplified measure and the intended trait (e.g. heritability of taking Prozac vs. heritability of depression). Heritability is specific to whom the trait was measured in. Since the heritability involves the total variation of the trait in the population, it matters in what population you’re comparing the genetic effects. The heritability of the trait in individuals from a particular country, ethnicity, range of ages/birth years, and/or socioeconomic status (among other features) may or may not be the same as that trait’s heritability in a different population that has a different genetic background and is exposed to a different environment. Heritability is not fate. Just because a trait is heritable and exists in your parents doesn’t mean you are destined to have that trait. It may be more likely, but it’s not inevitable. Heritability is not immutable. Since heritability reflects the balance between the effects of genetic and environmental factors, if you change the environment you can change the trait’s heritability. Heritability does not measure our ability to affect the trait. Hair color is highly heritable, but you can dye you hair whatever color you wish (including colors you can’t inherit). BMI (body mass index) is heritable, but that doesn’t mean diet and exercise can’t have an impact. In other words, heritability is not some final statement on the power of “nature vs. nurture”. High heritability does not mean group differences are genetic. There is a troubling history of attributing observed group differences, such as reported racial disparities in IQ scores, to genetics. As noted above, heritability is specific to the choice of measurement, population, and environment, and the heritability of a trait is not immutable. As a result, it’s not valid to use a trait’s estimated heritability as evidence for “inherent” differences between populations. Estimating the heritability of a trait (in a given population) is a starting point for understanding that trait, rather than an end goal. This is even more true for the version of heritability we’ve estimated in UK Biobank, which only accounts for a portion of the total potential genetic variation influencing a trait. For geneticists and biologists, heritability is some indication of what traits will be fruitful to study. By providing a metric for how much a trait is related to genetics as opposed to other factors, it tells us how much to consider genetics if we want to learn more about the causes for that trait. In health care, the heritability of physical measures (BMI, blood pressure, etc) and disorders provides insight on how much family history may predict patient outcomes, and how useful genetic testing may become for predicting disease risk and treatment outcomes. Estimating heritability is also of interest in social science, where existing research suggests many aspects of life - from personality to education to sleep schedule to how many kids you have - are at least a little bit heritable. Identifying heritability in these traits can suggest areas where our DNA, often in complex and indirect ways, is associated with social outcomes. And for all of us, knowing the heritability of our traits provides a little more understanding of the role of our DNA in shaping who we are. Genetics is almost never as simple as “nature vs. nurture”, but studying the heritability of human traits at least provides a glimpse of how those forces interact and points the way towards what we may be able to learn from our genes in the future. We’re going to use “trait” here to broadly refer to basically anything you could observe about a person. Their height, their weight, their personality, how much coffee they drink, whether or not they have a specific medical condition, etc. More formally we’re talking about “variance”, a way to measure how much a trait tends to differ between different people. We’ll cover this is much more detail in Heritability 201. Both results for European-ancestry populations. Estimated heritability of height from multiple sources discussed by Vissher et al. (link below). Estimated heritability of sleep duration from Gottlieb et al. 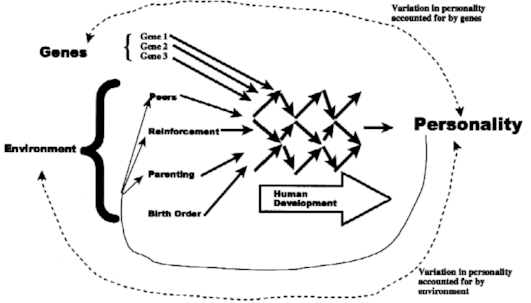 Schematic diagram of contrasting roles of genes and environment in development of personality. One-headed arrows link causes to effects; two-headed arrows indicate correlations. Genes and environments are both causal inputs into an interactive developmental system (represented by the network of arrows in the center of the figure), but because people select and shape their own environments (as represented by lighter one-headed arrows from personality to environments), correlations across the developmental system (dotted two-headed arrows) are easier to detect for genes than for environments.